When it comes to building one way incoming links for a web site, you have a lot of solutions. One of the top methods out there is through a service called BuildMyRank. Through this subscription based web site, you can write short 150 word articles, which they will then post to their network of web sites, all ranging from a Page Rank 1 through 6. If you get lucky, you will receive a link back from a Page Rank 6 web site, but the major of incoming links will come from a 1 – 3 ranked site. After throwing 300 articles into the BuildMyRank service, you can see how they distributed my content across their network of sites. As you can see, more than half of the links placed within the network are one way incoming links from PR 1 and PR 2 sites. 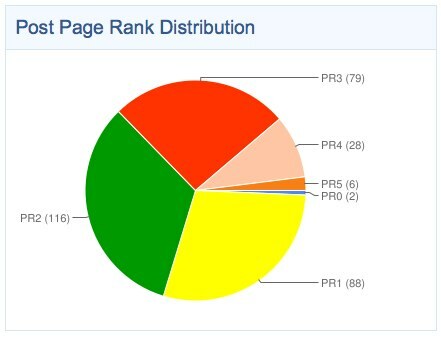 It’s nice to see that more than 25% of the incoming links are from PR 3 and 4 web sites. Incoming links from PR 5 sites are rare, at roughly 2%. I’m still waiting to have a PR 6 incoming link show up in the results. Since 150 word articles only take a couple minutes to complete, and are quite cheap to outsource, you can still use the BuildMyRank service to build up your incoming links to your inner site pages and focus on long tail keywords. The process for adding links to their system is dead simple. Write up a few 150+ word articles. Keep an eye on your backlinks process. For a more in depth BuildMyRank review, be sure to check out BloggingTips.com, which is one of the site’s I’m currently playing around with for long tail keyword link building. This is the first month I’ve started testing BuildMyRank, so expect more updates in the coming weeks. BuildMyRank is currently offering a promotion where you can get 10 free incoming links just for using their system. No credit card required, so try it out today!